TORQ Recovery Plus+ is a Hot Cocoa drink that has been designed for regular (twice daily) use during periods of very intense training stress. TORQ Recovery Plus+ has not been designed to replace TORQ Recovery; it should be used in conjunction with it, because it’s a totally different kind of product. Therefore the ‘Plus+’ part of TORQ Recovery Plus+ means ‘in addition to’ not ‘better than’. HMB has been removed from TORQ Recovery and put into TORQ Recovery Plus+. This nutrient has amazing nitrogen-retention qualities, which makes it both naturally anabolic (body building) and anti-catabolic (prevents muscle breakdown). However, to achieve the full benefits of HMB, it should be taken daily and in divided doses during heavy training. Even during heavy training periods, it’s rare for an athlete to consume TORQ Recovery every day, plus it’s designed as a single dose supplement immediately post exercise, so we wanted to design a product that they could take every day (twice per day) during this time. Beta-Alanine and Sodium Phosphate, which are the other two potent micronutrients that feature in TORQ Recovery Plus+, should also be consumed in divided doses, so these feature with HMB in the product too. Beta-Alanine is a branched chain amino acid that helps to increase lactic acid buffering (removal), which results in increased anaerobic power as well as aiding recovery between high intensity racing/training bouts. Sodium Phosphate complements Beta-Alanine by empowering the aerobic system to round off a truly comprehensive system. Ultimately, TORQ Recovery Plus+ doesn’t only aid recovery during periods of high training stress, it contains key ingredients to boost performance as well. TORQ Recovery Plus+ will give benefits if taken continually during any high load training period, because of its HMB content, but the Beta-Alanine and Sodium Phosphate offer most potential during high intensity interval training and racing. Therefore, TORQ Recovery Plus+ is ideal for use throughout the competitive season, or in the lead up to (and including) a training camp or cycling holiday, where exercise intensity is going to be mixed (intense and prolonged). The product is good for lower intensity high volume training periods too, but financially it may be wise just to supplement with TORQ’s RAW HMB during these periods and save TORQ Recovery Plus+ for when you introduce higher intensity training. So, TORQ Recovery Plus+ is a hot cocoa drink containing HMB, Beta-Alanine and Sodium Phosphate that is to be taken twice daily. It doesn’t have to be mixed hot, but it really does make a great tasting cup of cocoa, so we advise that you take your time and enjoy this product. If you’re in a rush, add 2 level scoops of the powder to 250ml of water in your mixer bottle and give it a good shake. Unlike TORQ Recovery, TORQ Recovery Plus+ is not affected if you use milk as a base instead of water and it can be sweetened if necessary with sugar. We can’t think why you’d need to do this, but it’s certainly an option for the sweet-toothed. It’s really important that you don’t add milk to TORQ Recovery though; you must make this with water or it won’t work properly. Calcium is an important mineral used to coordinate muscle contractions and is another mineral that’s lost in sweat, hence why it’s also found in our flavoured energy drinks. It is also important in the building of bone tissue, nerve transmission and clotting of blood. A serving of TORQ Recovery Plus+ contains 142mg calcium (285mg per serves - around a ¼ of your GDA). Potassium is an electrolyte which helps regulate fluid balance, nerve transmission and acid base balance; it has also been suggested to help in the prevention of muscle cramps. 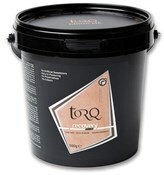 TORQ Recovery Plus+ gives 150mg per serve (300mg per 2 serves). Potassium has a GDA of 2000mg. Usage of TORQ Recovery Plus+: TORQ Recovery Plus+ should be consumed daily, even on rest days. Intermittent use of this product is not recommended, because you’re unlikely to glean the full benefits. All of the nutrients in TORQ Recovery Plus+ need to be taken daily and in 2 divided doses to have maximum effect. The research suggests that HMB and Sodium Phosphate will have a reasonably immediate effect, but many of the studies into Beta-Alanine supplementation suggest that the greatest benefits are likely to be gained once the amino acid has been in your system for a sustained period of time and most protocols have tested athletes after a loading phase of 4 weeks. That is not to say that benefits won’t be gained in less than 4 weeks, but if you have a particular goal in mind, you should aim to start consuming TORQ Recovery Plus+ during the 4-week training phase approaching it, or earlier.